After the excesses of the weekend you'd think the last thing I'd want to do come Sunday morning was to drag myself out of bed, get down to the station and catch a train over to Huddersfield for yet more beer. But I did, and I wasn't alone. There was probably another 50% on top of the people who'd signed up for the tour, all there at 10.40am, hulking huge cases of clothes and beer collected over the weekend (not that anyone was collecting clothes as far as I could tell) on to the train, then the minibus, then into the brewery. The team at Magic Rock got the tone absolutely spot on. 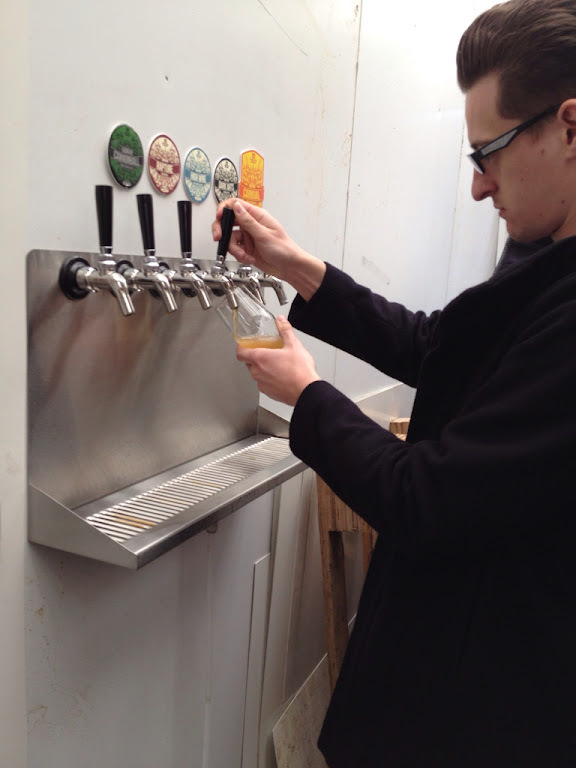 Come in, grab a glass, help yourself to a beer from the taps, we'll give you a tour once everyone's settled in. 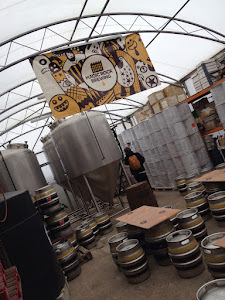 It gave us all chance to drop our bags and relax before looking around the brewery properly and it took the question "when do we get to try the beer!?" out of the picture straight away. The brewery itself is a seriously posh piece of kit. Custom designed mostly by head brewer Stuart just over a year ago, it's a 12 barrel setup which seems to be working like a charm if their beers are anything to go by. Which has to be a brewers dream right? 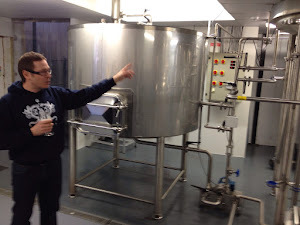 Thats's Rich in the photo pointing towards the fancy conical kettle just out of shot - the shape makes the removal of yeast etc much easier and gives better control when using shiploads of hops. Which they do. After the tour it was time for more excellent beer, served straight from the cold room via that fancy keg font, and a burger straight from the BBQ. Perfect. .....Grab a beer, grab a burger, sit on an empty cask next to huge fermenting vessels, why can't all brewery tours be like this...? Like a lot of people I went for the wonderfully fresh hop flavour of a High Wire upon arrival, then after that a small glass of Rapture before a charred burger and a Dark Arts. I've always found stouts and porters to go really well with BBQ food and this was no different, particularly with the tangy chilli salsa I laced mine with, as the smooth roasted malt mellows at the heat rather than fighting it with hops. Something which Mark Dredge wrote an interesting post on recently actually. The one beer which was making its debut whilst we we there was a Bourbon Barrel aged version of their monster 10.5% abv imperial Brown Stout "Bearded Lady". Rob from Hopzine.com recorded a video review whilst we were there which I'm really looking forward to watching, if only to see how the great atmosphere of the place comes across on camera. From my point of view, it's a big, sweet, full on flavourfest of a beer that gives plenty of sweet vanilla and bourbon on the nose but is more roasted, coffee hinted and rich in taste. The bourbon pokes through after a while but it certainly doesn't dominate, and that big abv is hidden extremely well. All in all a delicious beer which I can't wait to drink again. 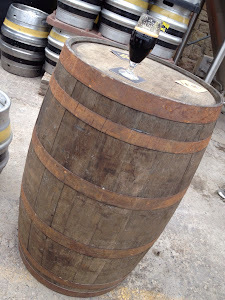 The photo shows the beer sitting atop the very barrel it was aged in, which was handily located right next to my cask constructed table. A huge thank you has got to go to the guys at Magic Rock for being such good hosts and making us all feel so welcome. They're not only making great beers, but they're nice guys to boot, which makes a brewery tour a real pleasure from my point of view. Cheers Neil, glad you enjoyed the day! we had a lot of fun hosting.